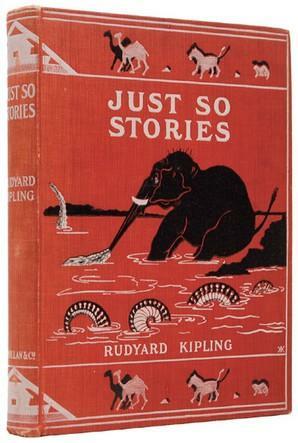 “Just-so stories” are named after Rudyard Kipling’s 1902 book of animal fables. Image courtesy of Wikimedia Commons. Sloth-moth symbiosis. Dinosaur-devestating asteroid impacts. Girl’s preference for pink. Are these fact, or fiction? Sometimes, what we think we know about the natural world is based more on story-telling than the scientific method. Calling something a “just-so story” in science is almost universally intended as a criticism. The term is a reference to Rudyard Kipling’s collection of children’s fables that playfully use species traits as a framework for teaching kids important life lessons. “How the Rhinoceros Got His Skin,” “How the Leopard Got His Spots,” and “How the Camel Got His Hump” offer moral, rather than scientific, explanations for evolution. They’re entertaining, but not factually accurate (hence the pejorative). I agree with Barash that just-so stories are a good starting point; they set up theories, and ecology could use more prediction in general (see this excellent series of posts by Brian McGill at Dynamic Ecology). The real problem with just-so stories comes when we tell those stories over and over to the point that they become accepted as fact, without supporting evidence or rigorous testing. For example, in evolutionary ecology, it’s easy to interpret every trait as an adaptation, whether we’re talking about why giraffes have such long necks or the reason human females have concealed ovulation. Sometimes, in our quest to explain every single attribute in terms of natural selection, we forget the importance of random processes or other mechanisms that may be equally important in nature. Because just-so stories make good narratives, I think they’re especially compelling to the general public, and this makes them insidious, and as tricky to stamp out as those misattributed quote memes– we want them to be true. Let’s be honest, here: which makes a better story? 1) The fluting in Clovis points creates effective blood channels, allowing hunters to effectively take down large prey like mammoths. 2) The fluting in Clovis points serves no practical purpose, and was probably decorative or ceremonial. I’ve always learned (and loved) #1, but there’s increasing evidence (so my archaeology friends and colleagues tell me) that #2 may be more likely. Bummer! 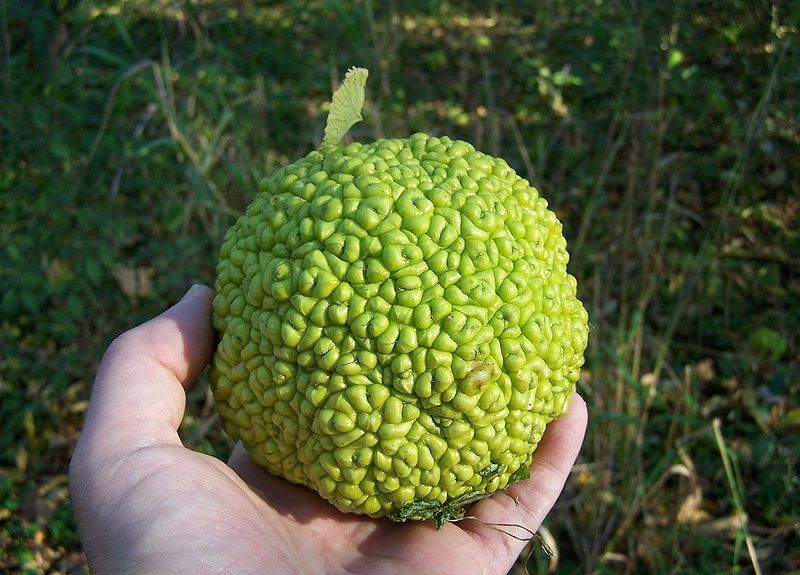 Fruit from an osage orange (Maclura pomifera)is thought to be an adaptation to dispersal by extinct ice age herbivores. One of my favorite ecological just-so stories involve fruits thought to be dispersed by mammoths and other extinct megafauna. Since Janzen and Martin’s classic paper, Neotropical Anachronisms: The Fruits the Gomphotheres Ate came out in 1982, there has been little empirical work on the ecology and evolution of large-fruited plants and megaherbivores. I think this is due to a few factors: 1) People think it’s difficult or impossible to test these sorts of hypotheses. 2) Thought pieces that are critical of the hypothesis have convinced people that the Janzen-Martin Hypothesis is not worth testing. 3) People accept the just-so story of megafaunal dispersal syndrome because it’s so compelling, and don’t feel the need to test it rigorously. Personally, I don’t think megafaunal fruits or other just-so hypotheses are impossible to test, particularly with interdisciplinary approaches and outside-the-box thinking. I’ve got a grad student working on the problem right now, using some creative techniques. The criticisms of megafaunal dispersal syndrome may be valid, but unless we test them, they’re just another form of story-telling (valuable though they may be). In the meantime, my grad student’s research, inspired by Janzen and Martin’s hypotheses, may yield surprises of its own, thanks to some creative story-telling about the natural world. I think we should be looking to just-so stories for inspiration, but not necessarily explanation; they’re scientific horizons, not dead-ends. What just-so stories need testing in your field of science? Which do you love (or love to hate)? There is now an annual Festival of Bad Ad Hoc Hypotheses. See http://www.bahfest.com/. I have very fond memories of my mom reading me those stories as a child. For some reason, “How the Elephant Got His Trunk” is the one that really stands out to me. Might have to do with how mom read the elephant’s voice protesting, “Dis id doo bunch for me!” when the crocodile was pulling his nose. I take it you feel that Dawkins and e.o. Wilson’s work are “just so” stories? All of their work? No. Aspects of sociobiology, behavioral ecology, and evolutionary psychology? Yes. Which is not at specific to Dawkins or Wilson, so I’m not sure why you bring it up. Basically, I think that it’s important to test stories with data, rather than accepting them at face value. In many cases (like evopsych), you can make different arguments from the same data, as Natalie Angier’s book Woman: an Intimate Geography explores so eloquently. Oh, that book isn’t at all specifically about Dawkins or Wilson (and neither was this post). If you want to read critiques of the selfish gene theory, as I mentioned, Richard Lewontin and Stephen Jay Gould would be worth checking out. Anybody tried feeding osage oranges to elephants? Not to my knowledge, but we’re thinking of some possible experiments in our lab! A deeper problem in this whole thread is an assumed baseline that I now am frustrated to report is a deterrent against conservation action re global warming’s growing effect on even common forest trees in the Rockies. The baseline is this: It is standard practice to uncritically assume that a fruit evolved in order to just sit through the winter beneath its parent tree, or to be picked apart by seed-predator rodents (after it has been on the ground long enough for the sap to lose its stickiness). Only if you can prove that it is missing a megafaunal disperser will this assumption be upset. My suggestion: Disallow all assumptions, especially the baseline, for anything that ridiculously violates the norm that plants do not invest in extravagant seed coverings unless they need to fend off seed-eating insects during development (e.g., citrus) or attract a vertebrate long-distance disperser (eg. hedge apple and KY coffee tree) or protect their large seeds during ocean transport. To see how this assumed static-ecology baseline is thwarting conservation of our forest trees in a rapidly warming climate, google to find the 5th episode in my 2014 “Climate, Trees, and Legacy” video series, titled Rocky Mtn Trees in Climate Peril. We desperately need paleoecologists to cross over into the field of conservation biology in order to make a difference there. Yet to see paleoecologists “dithering” (the verb climatologist James Hansen made famous) among themselves in the way evidenced in this blog thread makes me wish that Paul S. Martin were still alive and capable of calling the troops into action — to question the assumptions and put our science to real use (e.g., in his advocacy for retaining burros in the Grand Canyon and for establishing “Pleistocene Parks”). Given the reality of climate change, and the unstoppable elements of it, even those causes of Paul’s (the latter of which I used to be a co-advocate for) now strike me as mere niceties and curiosities within a culture still focused on “endangered” life forms (including my own beloved Torreya taxifolia; I am the founder of Torreya Guardians, which moved this climate-damaged tree in 2008, thanks to loopholes in the Endangered Species Act). What I and many mainstream foresters are sounding the alarm about today is that, given the trend of climate change, even common trees will need massive human assistance within the next few decades (beginning right now in the decimated Rocky Mtn forests, e.g. for Alligator Juniper) to have a hope of tracking climate change within your lifetime. Truly, it is that desperate. And there is no more important discipline to bring into forestry than that of paleoecologists. You all are the only ones who can put to rest the fear of “invasiveness” if assisted migration of native trees is taken northward. You are the ones who can educate static ecologists into realizing that N-S movements over hundreds, even thousands of miles are the norm over the tens of millions of years that tree species have been living and moving and adapting on this continent. Only paleoecologists can convey how exponentially beyond the norm is the 21st century speed of climate change — and thus how common plants with 30-50 year generation times (e.g., many forest trees) and that do not use the wind for long distance dispersal will be unable to keep up with the climate change already baked into the system — much less with what will likely accrue as the denialists and delayers retain power to influence dominant views. Note: Connie Barlow is the author of the 2001 book, “Ghosts of Evolution” and coauthor with Paul S. Martin of the 2004 paper “Bring Torreya taxifolia north now.” She is the founder of TorreyaGuardians, and recently retired into radical climate activism in behalf of North America’s trees. Yes, there’s only so much we can expect extant Proboscideans to mimic paleo-Proboscideans, assuming those were the most important dispersers of osage orange (there were lots of candidates). You also bring up lots of points about how such experiments aren’t quite useful if they’re in a vacuum. I’m afraid I don’t follow your point about baselines and deterrents to conservation, so I won’t respond to those. I don’t agree that discussion equates to dithering; I don’t see hand-wringing here, I see a conversation about future directions for important research. We’re actively researching these topics, and I think there’s a room for informed, thoughtful science as well as passionate and timely activism. I am very aware of the urgency of conservation needs, but there have also been many examples of haste having unintended and disastrous consequences. I’m not making a precautionary principle argument against taking action; rather, I’m saying that we can’t (literally, in the case of academic scientists) abandon research in favor of direct action, especially when we have limited resources. In the “Ozarks” those “fruits” are called Hedge Apples and they are not to be eaten. One question I have for the ‘scientist’ in you, why is it that according to so-called carbon dating, some rocks are said to be billions of years old and only some millions? If they were on the earth, wouldn’t they all be the same age? Or do the older rocks have babies, hence forth, the “younger rocks”??? Yes, the fact that these “hedge apples” aren’t eaten by anything today is one of the red flags that’s encouraged scientist to tell these “just-so” stories. Very recently (geologically speaking– 10,000 years ago) there were large animals that may have eaten them, and the trees haven’t had time to adjust their strategy. Good question! One clarification: radiocarbon dating only goes back about 50,000 years (the half-life of carbon-14 is ~4700 years, short enough that anything older than 50,000 years has no measurable amount of radiocarbon left). We use other kinds of dating for those much older rocks. The earth’s crust is active, because our core is still hot– the tectonic plates are moving, causing mountains to form slowly as the tectonic plates push together. Deep in the oceans, some of this crust is being pushed underneath the surface of the earth, where it melts and gets recycled. Then, at other plate boundaries, new crust is being formed. So in a sense, yes, as old rock gets recycled into magma, new rock gets made! It’s one reason why it’s so remarkable to find rocks that date back billions of years to the earth’s beginning– so much of that rock has been recycled! And that’s just the igneous and metamorphic rocks — the rocks formed by these active processes in the crust. The sedimentary rocks are all formed by very different processes. Sand, clay, and other sediments are deposited in layers, and eventually the pressure form the upper layers causes the lower layers to harden into rock. This process takes a really long time — hundreds of thousands to millions of years — but it’s happening all the time. These sedimentary rocks are great environments to preserve plant and animal fossils, incidentally. great question and equally great answer! That’s been a question that’s been noodling around my brain for years – but I never thought to actually say it out loud. Thanks for asking for me Nick. My favorite “just so story” happens when I hear someone say “This (fill in the blank) evolved this (fill in the blank) so that this (fill in the blank) would happen.” “i.e. The giraffe evolved a long neck so that it could reach the leaves at the top of the tree where no one else was feeding.” There is no “So That” in evolution. There cannot be purpose. There is only time plus chance/chaos plus energy which excludes any meaning, purpose, or worth to existence. While I wouldn’t go so far as your final nihilistic statement, I do agree with your earlier points that evolution is not a directional or intentional process– and not all traits are adaptive! This book is now on my “to read” list. Science explains everything. Climate changes and so on. At The beginning MEN were not involved, but NOWADAYS its up to us. And The worst is about to begin…..
Reblogged this on lawrenceuche's Blog. I was homeschooled and these “just so stories” were a part of our education. I think partly why we were so prone to accepting a creationist standpoint on the history of earth was partly because the stories written by Kipling and Wells seemed so absurd that it took a lot of convincing to help me understand real scientific theories. I don’t know that the hedge apples keep spiders out of your cellar either. And they’re not good for ‘living fences’. They throw too many sparks as firewood. What is your purpose, Oh Osage Orange? I perfectly enjoyed the mastodon theory until you deflated it. I didn’t deflate the mastodon theory! I think it’s a very strong hypothesis. It just needs to be tested. Really enjoyed reading your post, found it fascinating! Just-so stories that interest me are ones that make blanket statements about mate fidelity in birds. I wrote a book a while ago that introduced a scientist who said contrary to popular belief, loons don’t necessarily mate for life. I read a book about Canada geese, showing they don’t necessarily mate for life either. So the average human does think animals mate for life because they want to feel connected with them. I often hear:Did you know they mate for life?” It’s giving them human qualities, patting them on the back for being a better animal… Intriguing. Reblogged this on "Not Black and White but Grey". My background was teaching and mostly history which had a lot of made up stuff. The legends of the people of the past would conflict with the truth and mostly we stick to the legend. We photo erase the zits and armpits and clean the stink off of the bad things. I guess that is necessary. Did I really want the students to know about Washington’s teeth or the indiscretions of Franklin? At first, I thought that fruit was a flower of some sort! Very interesting! Though I do not have a background in science (I had to google some phrases in your post), I was drawn to your reference to the fruit of the osage orange. We came across such fruit (and nondescript tree) during the fall last year. The tree is located in central New Jersey. We took pictures of the strange fruit and looked it up when we got home. It is a romantic notion that any of the just-so stories concerning megafaunal dispersal syndrome are true but it certainly ignites the imagination. As a mom, sometimes those kind of just-so stories, though not altogether proven as true, help inspire healthy conversation and interest within my children to learn about when the mammoth roamed our planet. Congratulations on being Freshly Pressed and good luck on your research! Over nearly a half century on this planet, I’ve come to the conclusion that anything that tries to explain gender is ALWAYS a just-so story. From any angle. Men are X, women are Y, whatever. Pure crap, without exception. Pingback: How many moths must a sloth carry off for the sloth to rely on the moths? « Nothing in Biology Makes Sense! That is so amazing and such a coincidence. I am reading “The Sixth Extinction” subtitled “An Unnatural History by Elizabeth Kolbert. Yesterday I was looking to buy the 37 Book Pliny. Bound it was $100+. Not in the budget this time. Then serendipity this pops up on FB. Fascinating. Ah. But testing in modern ecosystems would only indicate that megafaunal dispersal is “possible”, not that it actually occurred in Pleistocene North America. Modern analogies are very useful for coming up with hypothetical expectations that could then be tested in the paleoecological record. Ultimately, teasing out paleoecological patterns must rely on paleo data–not modern analogy. I think it depends on the question. Modern process studies can provide mechanisms, which we can’t necessarily ever glean from the paleorecord. When it comes to megafaunal dispersal, some of the modern elephant studies have been really important, but there are other things we can look at (genetic structure, dispersal rates) that may or may not come from paleodata that can also be useful. Ultimately, when it comes to the past, we always have to live with a degree of uncertainty (e.g., I can say whether fire activity increased or decreased but not for certain if that was caused by humans or climate change or both), but I do think we could do more modern experimentation than we do. 2. Test fruits on hind-gut African-Asian megafauna living on large outdoor acreages in America. I did the first part of that experiment a few years ago with an Indian one-horned black rhino and America’s Gymnocladus dioica (KY Coffee Tree). The rhino (rhinos are known to be the least picky hindgut megafauna) happily took pod after pod from my hand, out the truck window. Now somebody needs to survey the acreage to see if any KY coffee trees actually grew out of the dung heaps! Google this sequence to see my online photo-essay of that event in SE Ohio (on breeding properties owned by a 3-zoo consortium, “The Wilds”): Arkansas River Pleistocene Dreamtime. IDEA: It just occurred to me that it might be useful to explore the degree to which long-distance dispersal would be helpful or wasteful. We all know that you got to get out from beneath the canopy, but why a long distance? SJ Gould made a compelling argument that there is no selective value in preparing for an asteroid impact (e.g., 5 years of perpetual dark and cold), so the critters that make it through have adapted to other conditions that happen to be helpful at such extreme events. They are lucky. Obviously desert plants that launch seeds capable of patiently waiting quite a few years before trying to germinate would be “pre-adapted” to do well in the aftermath of an asteroid. To what extent have America’s non-plumed seeds of forest trees been pre-adapted for today’s rapid shifts in plant zones, owing to having trekked N-S many times during the Pleistocene? And what pre-adapted them prior to the Pleistocene to do so well on those recurring journeys? Some of those new elephant studies have been really important, and I think they provide an important conceptual linkage. I’d love to see more seed germination studies done, and I’m hoping to do that for an undergraduate thesis or MS in my lab soon. Your question about LDD is a good one; I think it depends on the context. Certainly, LDD is useful in a changing climate, particularly if that climate changes rapidly. But there’s no benefit to LDD if the environments you’re dispersing TO aren’t also habitable! I like this meme. I’ve never thought about it, but my favorite “just so” story is of the green sea turtles, which make a yearly 2,000 km migration from the coast of Brazil to Ascension Island in the mid-Atlantic. 40 million years ago, this migration was just across a small sea, but as continental drift pushed the points apart, the migration became epic. That’s a great one, and not one I’ve heard! It’s too bad it’s probably not true; it really is beautiful. This is very much related to the sorts of things I hope to work on in computer security. We have so many “security methods” that someone just thought up and never tested to see if they actually help. One of my hypotheses is that constant security prompting actually skinner-boxes people into just accepting any warnings that pop up; those prompts to allow a piece of software to use admin rights may well be making you less safe by making you reflexively accept anything that asks for permission.